A return to Carson, NM. Like an unfinished jigsaw puzzle, there’s pieces of the Carson National Forest across a sizeable patch of northern New Mexico. There’s a chunk up near Chama, on the Coloradan border, that runs all the way down to El Rito. There’s a slender strand to the west. And across the waters of the Rio Grande, there’s some sizeable portions north and south of Taos, set into the steep-sided folds of the Sangre de Cristo Mountains. 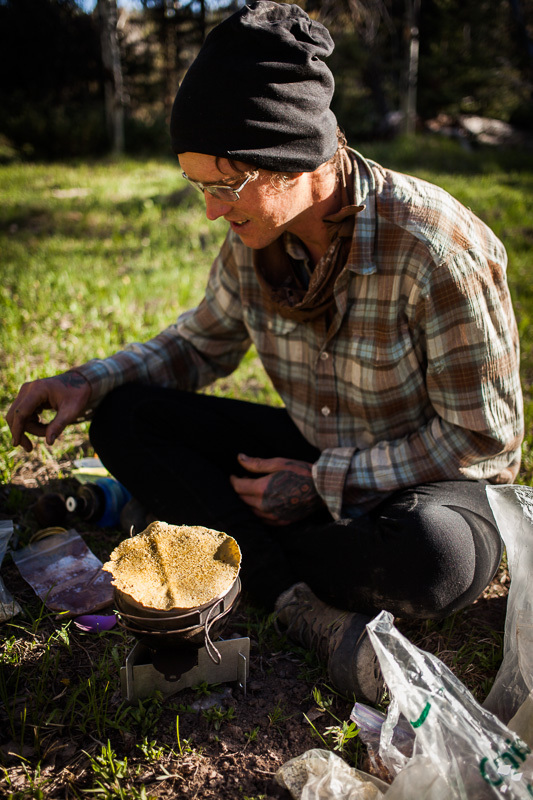 The last time Tim and I were there, snow restricted play – so we dipped into the ramshackle communities of Vallecitos and Plaza Cañon, north east of El Rito. This time, 6 weeks later and with summer making its entrance, we were able to push further north to quiet and remote high pastures, up at 10 500ft (3200m). 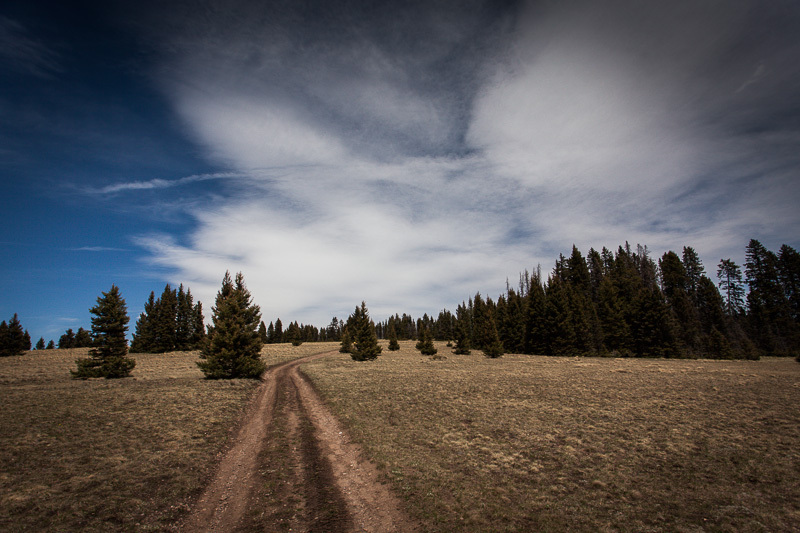 The lower flanks of the Carson National Forest are dusty and arid, straddling the threshhold between junipers and ponderosas. A Skunk Cabbage, so named for its odorous flowers. 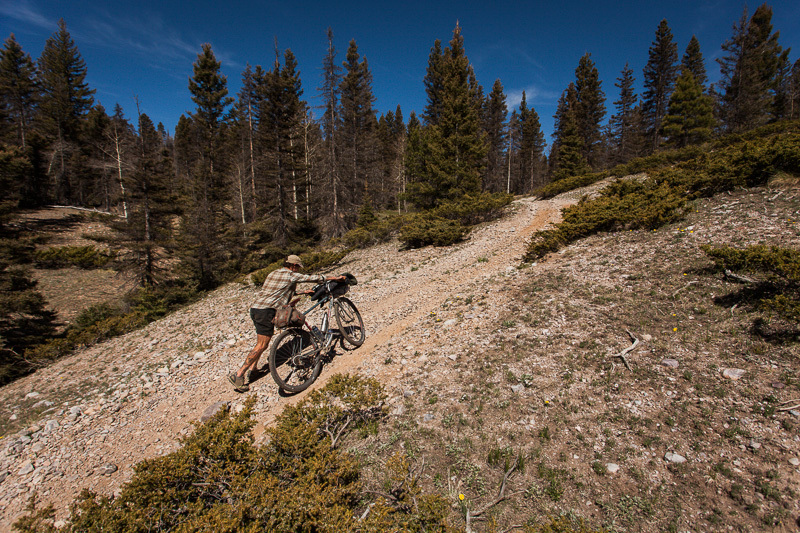 The scale of the forest is impressive – as is its network of barely-travelled trails. 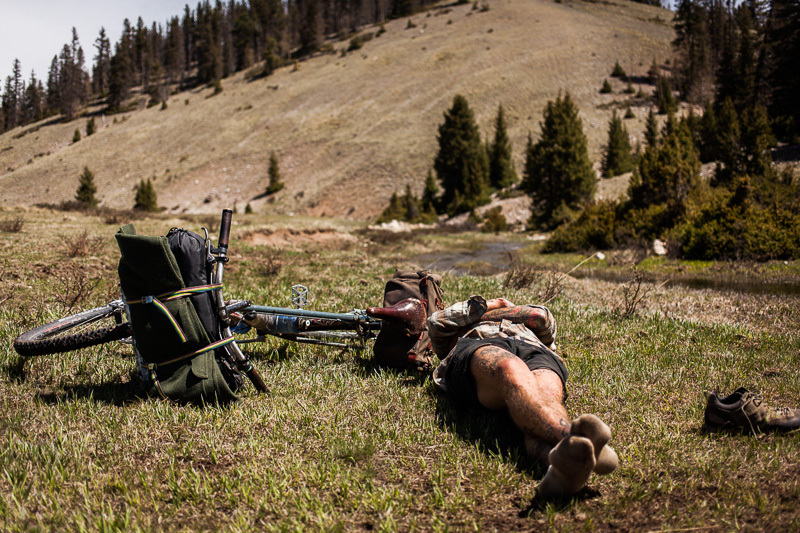 The logistics of bikepacking here are easy too, thanks to the abundance of water. Tim brought along his Steripen Freedom UV filter. 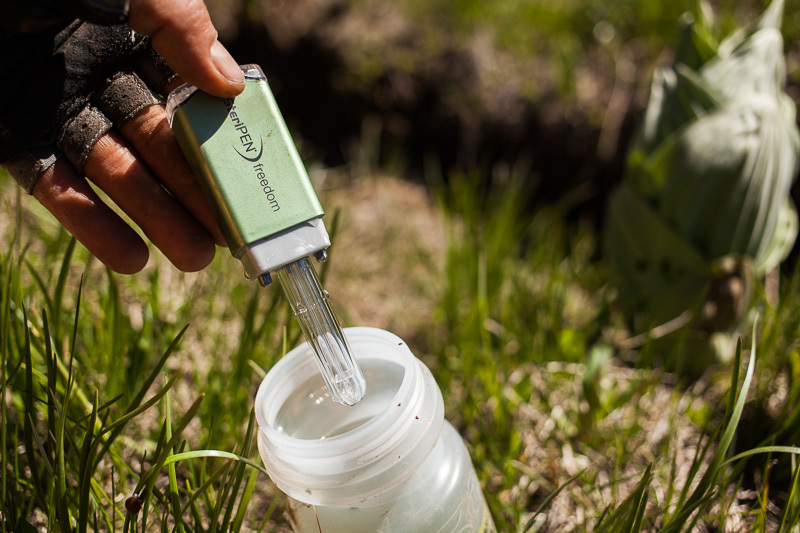 Its lithium battery is USB chargeable – a neat little device. Consultation of the map required. A spaghetti noodle of possibilities. And, there’s no shortage of good campsites either. My current setup: a 6 Moon Designs Gatewood cape – just 11oz/312g – with a Tyvek ground sheet and a -1C North Face sleeping bag. Aspen country. Come autumn, the place will be ablaze with colour. The kitchen. 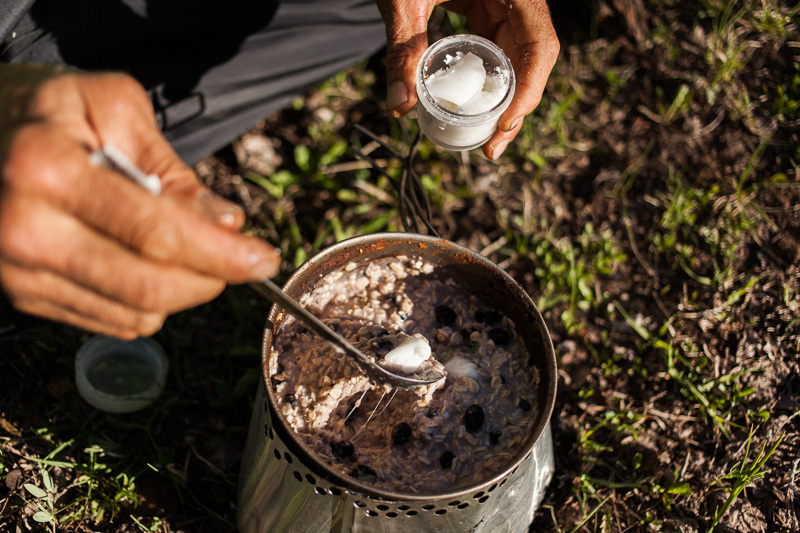 Cooking over his homemade caldera stove, Tim adds some coconut oil to his porridge – which packs both a tonne of energy for its weight, as well as lending a tasty richness to food. 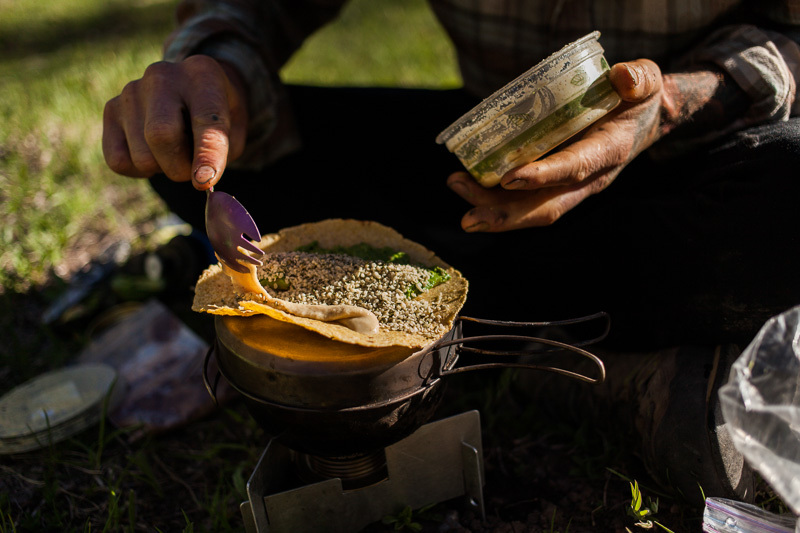 Jeremy goes for ‘hippy tacos’ – laced with guacamole, hemp seeds and tahini. 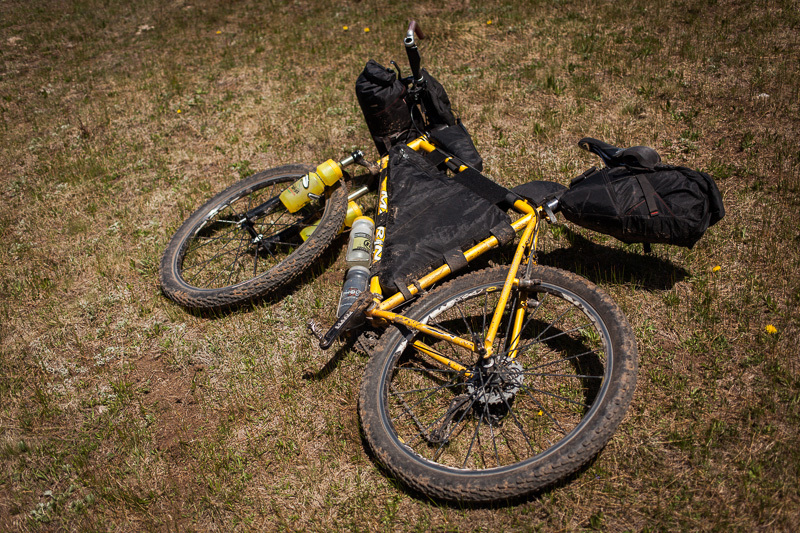 … and his steed: a faithful Marin Pine Mountain, clad with Revelate bags and shod with 2.4 WTB Mutano Raptors and weighing in at 25lbs. 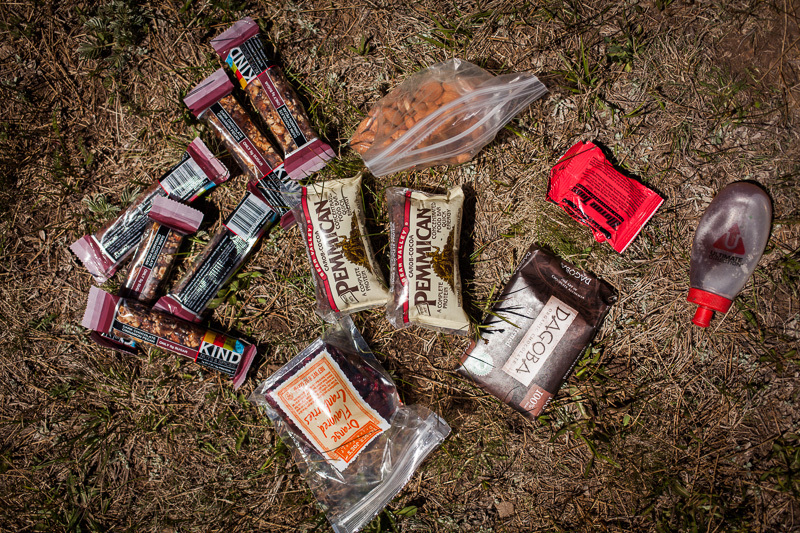 Gear, including food for two days (but no water,) adds another 20lbs. … and his Rivendell Hunqapillar. Complete with wire basket and heavyweight wool jacket. 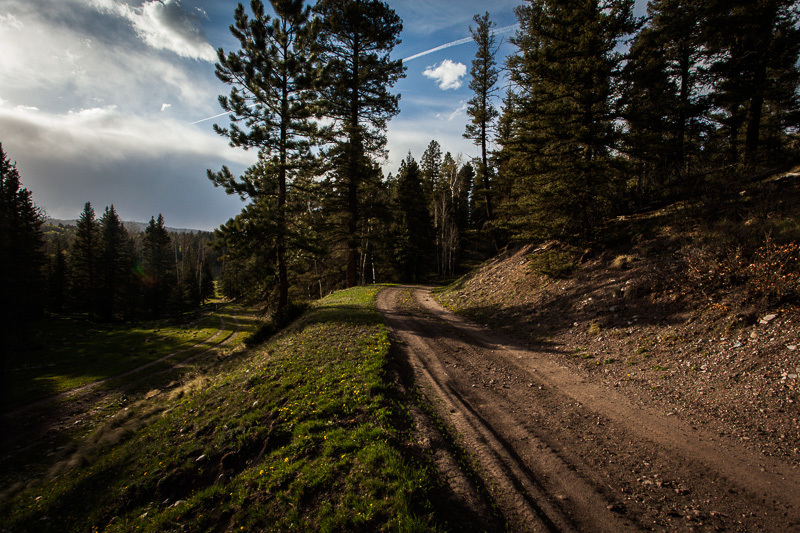 The terrain in the Carson National Forest covers the whole gamut – from rutted trails to off piste singletrack and graded roads. It makes for idyllic riding, linking one meadow to the next. 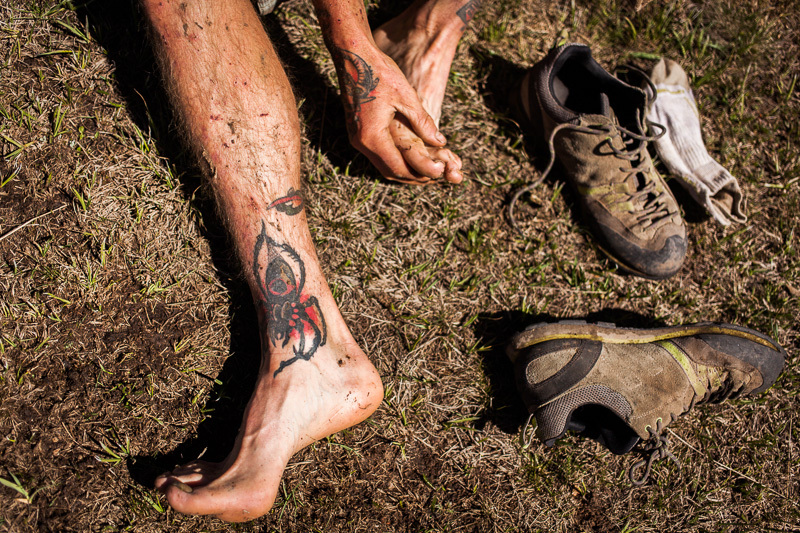 Stream crossings provide good excuses to go barefoot. Up on the high plateaux – 10500ft and still climbing. … and recovery naps required. 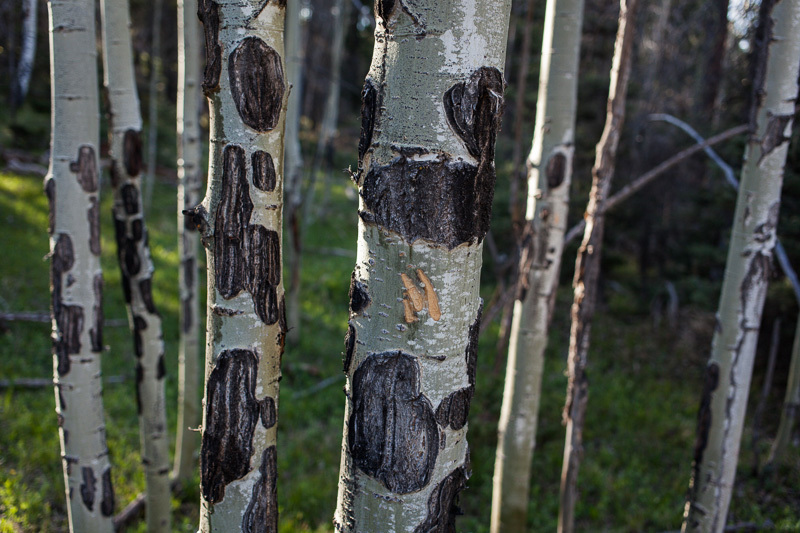 We wend our way through pines, spruce, aspens and ponderosas. It’s easy going riding, but no less enjoyable for it. 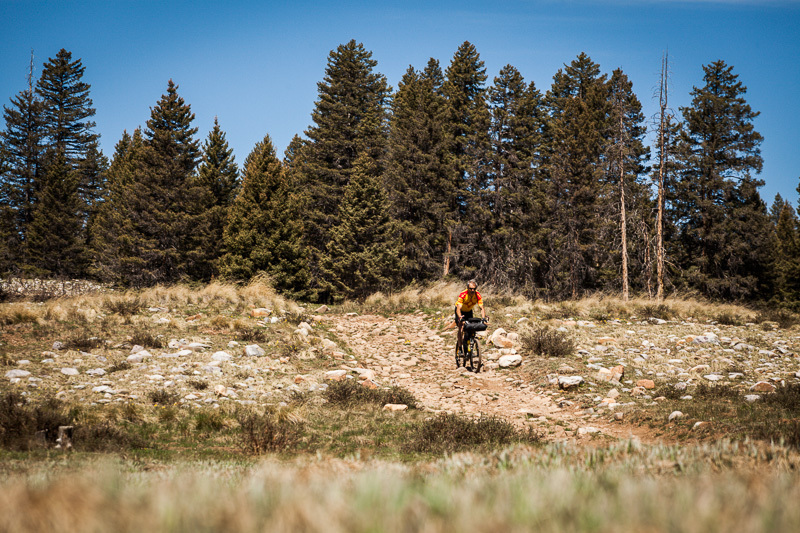 The Carson National Forest is a meeting point for the Great Divide Mountain Bike Route and the Continental Divide Trail . 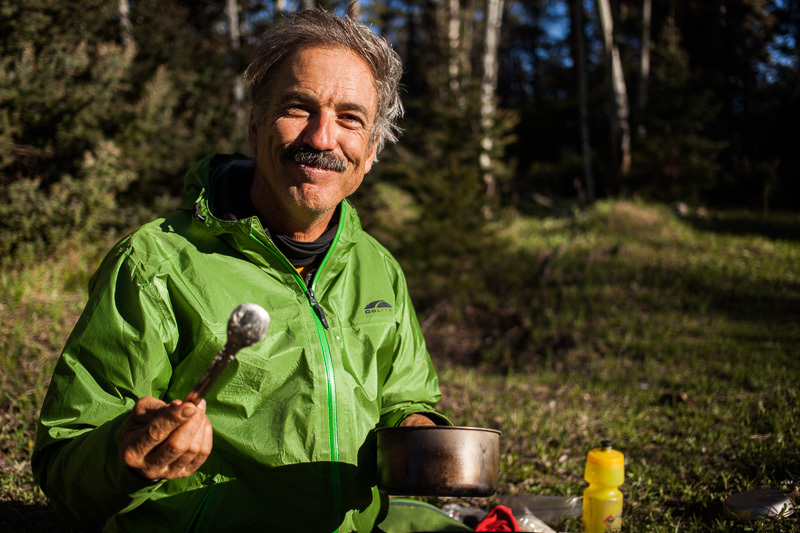 By the time hikers reach El Rito, they’re a month into a half year journey that will take them from Mexico to Canada, along the spine of the Rockies. The equivalent bike route is raced in as quick as 15 days. Jeremy heads back to the car to recoup. 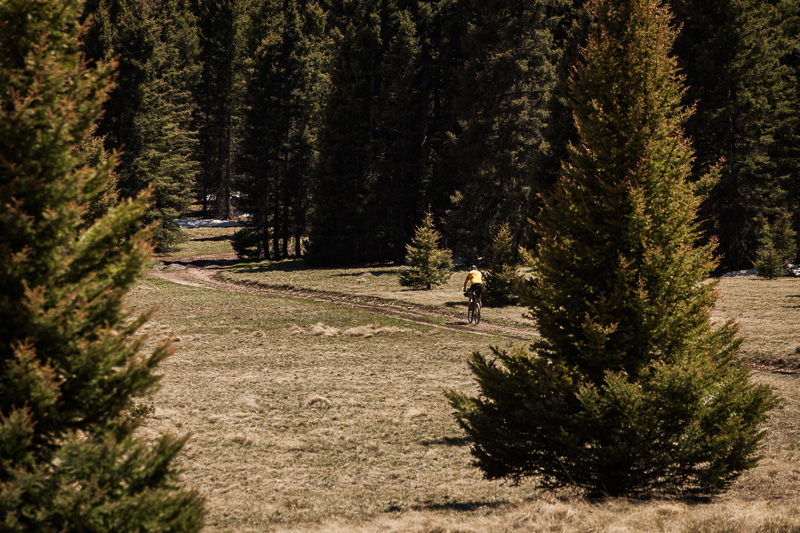 Tim and I go in search of singletrack. Another thicket of oderous Skunk Cabbages. 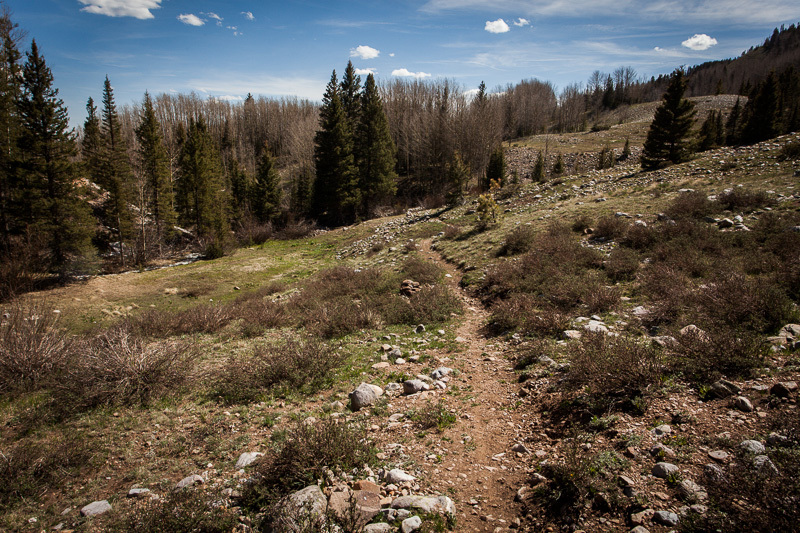 A newly finished trail leads us down to the Cajillon lakes, in turn linking up with the El Rito river, which we follow downstream back down to the car. 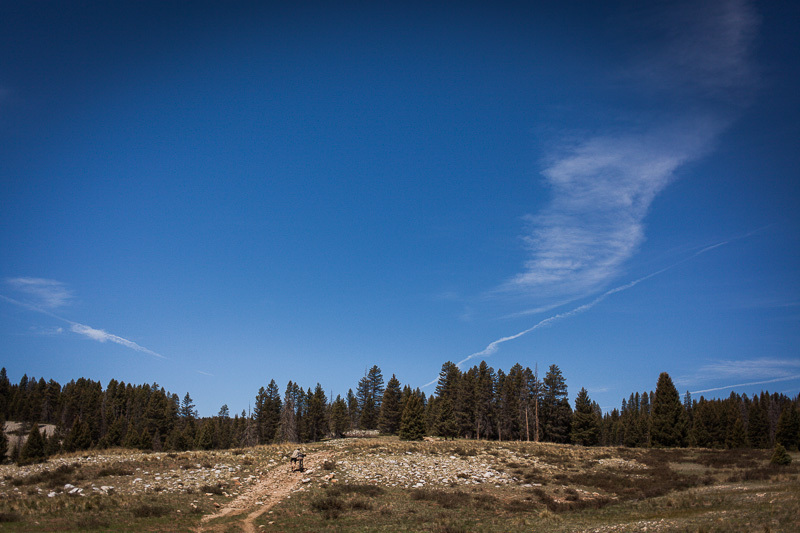 There’s a good access point to the Carson National Forest from El Rito (6875ft/2100m). You can park at the church, or the Blue Bus runs there from Santa Fe, via Espanola, during the weekdays. There’s space for two bikes onboard. We drove 5 miles or so north beyond the El Rito, camping inside the boundaries of the forest. Then we climbed due north via Cañon Largo, returning via the Cajilon Lakes and Caño Canyon. 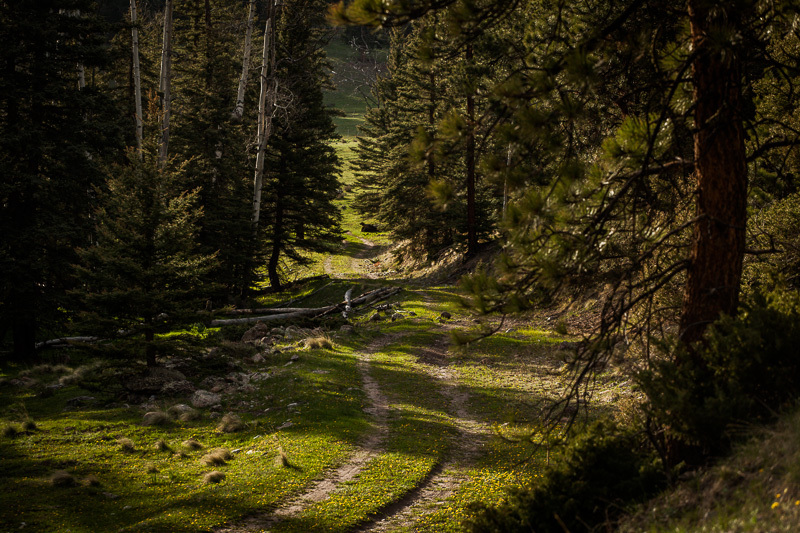 Within this piece of the Carson National Forest (the El Rito and Cajilon districts) there’s everything from well graded dirt roads to primitive, rock strewn affairs, looping up into the higher altitude meadows of the forest – 10 000ft/3 000m plus – and back down again. Plenty of scope for a few days of remote riding. Water is abundant, as are camping spots. note: The Bagman2 QR with Expedition Support suits me well, as it allows me to carry my Carradice Saddlebag – a cavernous bag that will fit my DSLR camera. Otherwise, I use a lighter, more minimal and rackless Porcelain Rocket Booster Rocket Seat Pack. 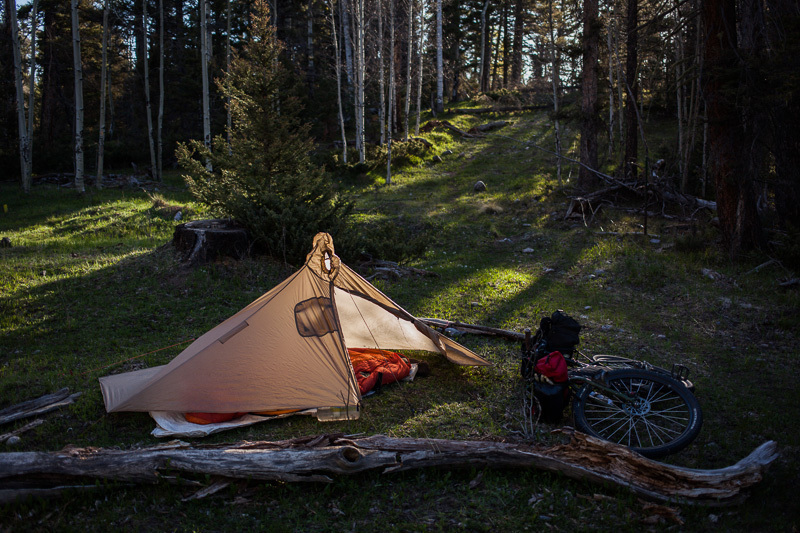 This entry was posted in Bikepacking, Carson NF, New Mexico and tagged Bikepacking, Carson NF on May 27, 2013 by Cass Gilbert. Terrain looks great! Love the third pic! Awesome photos, as usual. Coconut oil is good stuff! Have you tried it in your coffee to make ‘Bulletproof Coffee’? Thanks for the link Ken. I’m not a coffee drinker myself, but I’ll give it a go when I need a shot of focus! Sorry to hear about Jeremy’s ailments. In the old days it would call for a shot of cortisone and a beer, but these ain’t the old days and I doubt there were any emergency rooms handy. Otherwise, what great scenery, photography, and reporting. Thanks! In lieu of cortisone and beer, Jeremy has been acupunctured and moxad. I believe he’s on the mend. Perhaps attempting to ingest a semi-poisonous plant (Skunk Cabbage) wasn’t such a good idea. Great pics and post as ever, really great looking riding over there. I would love to spend some time exploring those desert trails, would make a change from the soggy cairngorm trails that we are currently suffering. I have a friend who just loves the smell of skunk cabbage, go figure?! Thanks. 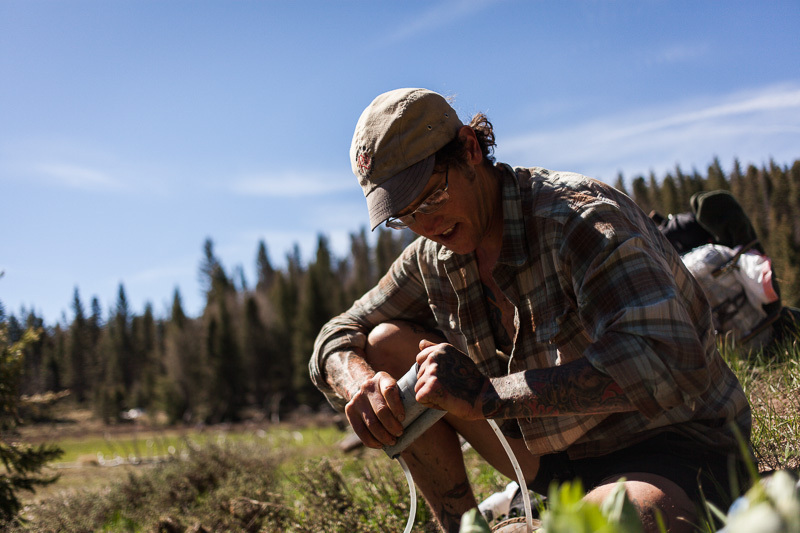 As it happens, the Skunk Cabbage (at least, that what we thought it was) wasn’t stinky at all – but later internet research revealed it to be pungent when flowering. I’ve been to the Cairngorms a few times. Once, it rained most of the time. Another time, it was beautiful sunshine (as part of the Scotland off road Coast to Coast). I absolutely love the riding there, and hanker to return at some point and close the ‘Cairngorms Loop’. But… I do feel very fortunate to be in a part of the world where there’s fantastic scope and space for exploration, and the weather makes for blissful riding almost every day. Those are NOT Skunk Cabbage. 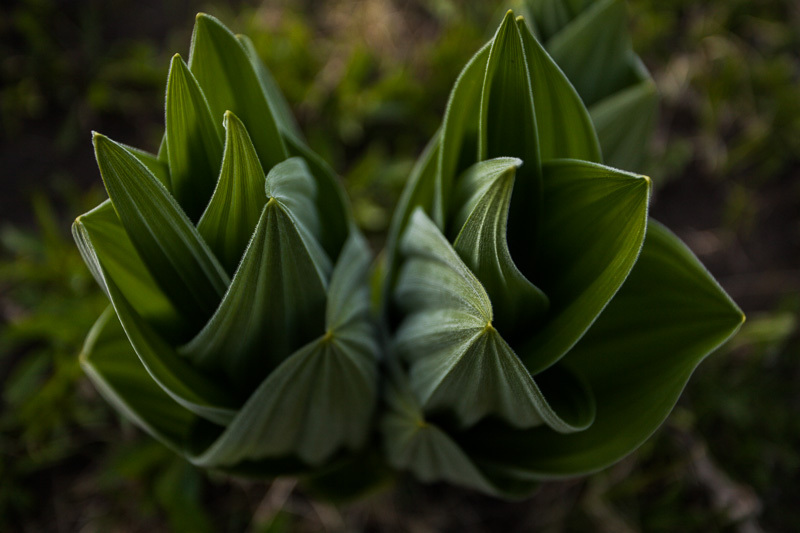 They look like they could be some sort of False Hellebore, which happen to be incredibly poisonous. Also, great pictures. I rode the GDMTBR a few years ago and this area was one of my favorites. Thanks for your comment Kina. You may well be right, though it seems there are a variety of Skunk Cabbages around, and the ones we saw looked just like the ones in this link. 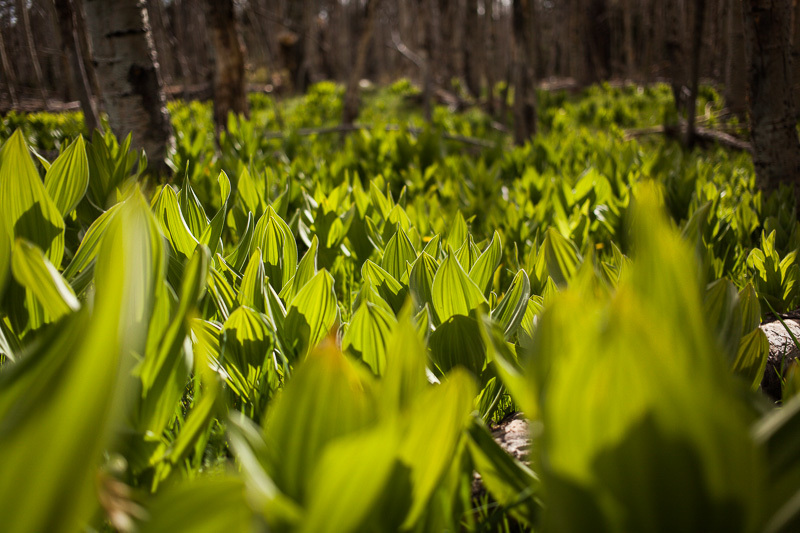 Interestingly, the photo in the agricultural university link below, seems to bunch Skunk Cabbages in the same group as False Hellebore. I’ve ridden 95 per cent of the GDMBR – my missing piece is Cuba-Grants (due to inclement weather), which I intend to ride soon. I’ve heard it’s another highlight of the route. Cass, Great timing for me on this post. I was recently again in NM and bought a DeLorme atlas of NM. Seems I am visiting more and more and am starting to brew up some plans for rides in my retirement future. 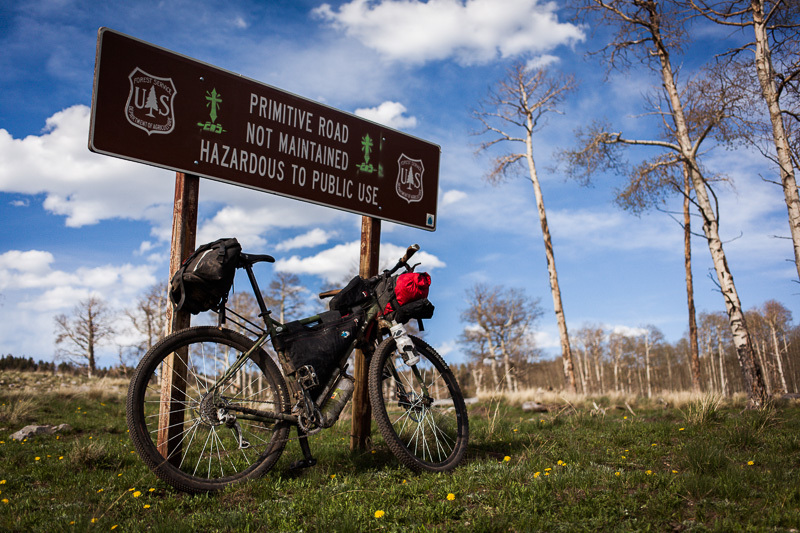 I already have a road tour planned for this summer but I am thinking of an off road tour for summer of 2014 and thinking of a forest service road route down through CO. This gets me thinking of a route from Chama that will eventually get me to my sisters house in Albq..Thanks for the post and getting my thought process going! Another great report. We appreciate you exploring for us. I’d spied this area, and, while hunting for more info my wife found your site. We are happy to find other bikepackers in NM. One specific question…Where does that single track start/end? If you have a moment could label it on a map and snap a photo for me, and sent it to danshorb at hotmail dot com. We’re heading there this weekend. We’d greatly appreciate it. Unfortunately, I don’t have the map to hand and I’m headed out of town tomorrow. 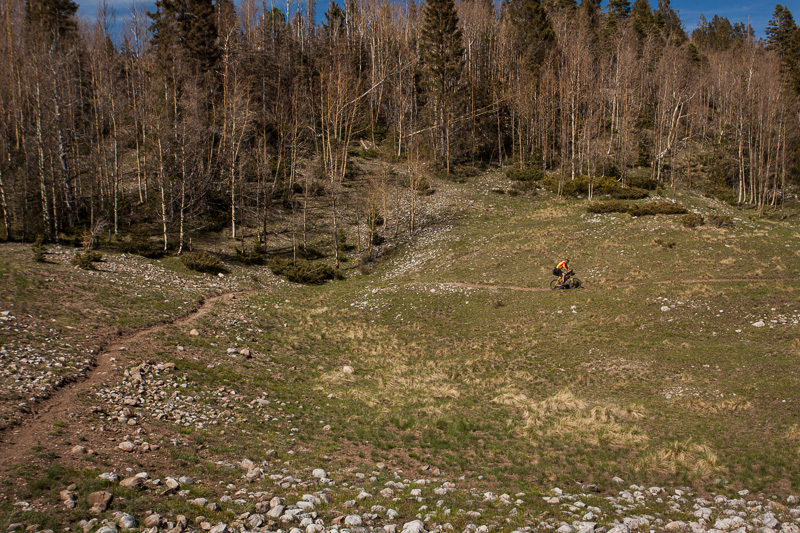 Aside from all the primitive roads, we found two short but enjoyable sections of more defined singletrack. 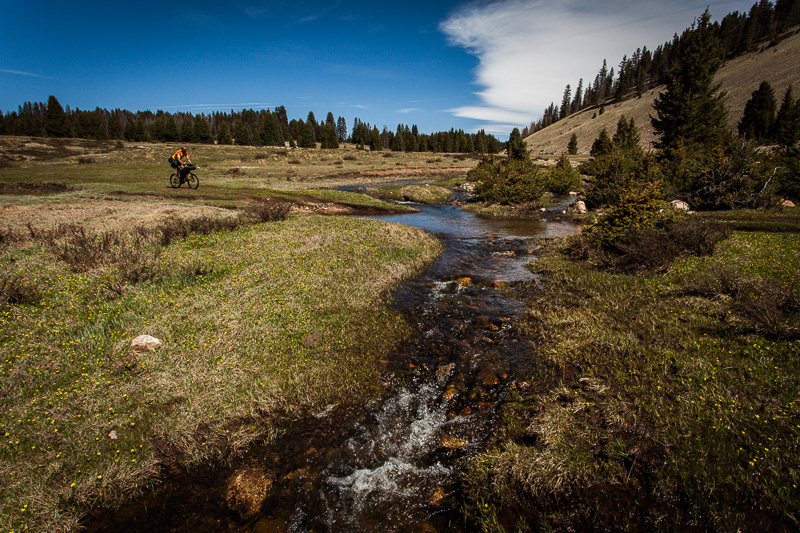 One dropped down to the top of the lakes, and involved some stream hopping to avoid lingering snow patches. The more defined singletrack began just past the first of the Cajillon lakes, after a bend in the road on the left hand side, I seem to remember. I should add though that there’s one particularly challenging section of blowdown to clear, which involves some serious clambering. The rest is pretty good – just a few fallen trees to negotiate. 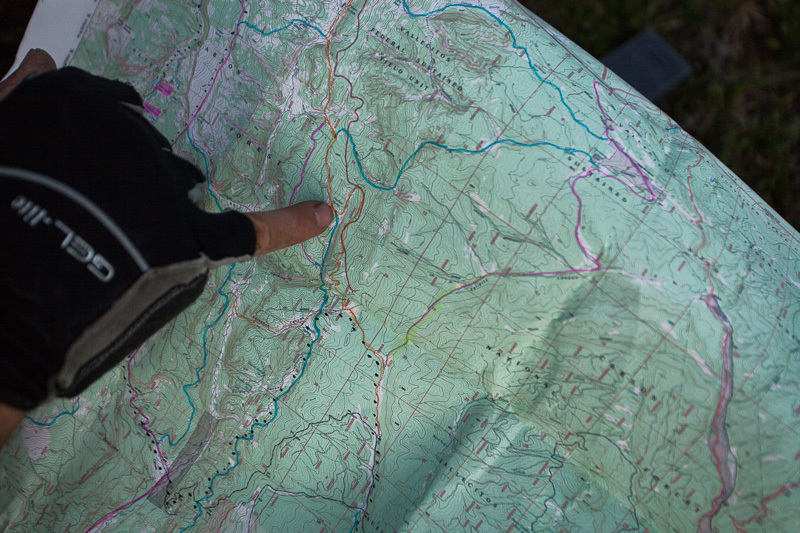 We heard about it after checking one of the CDT hikers map – it’s marked as a trail in progress. I’ll pass your details onto Tim, owner of said map. He’s ridden in the area a few times now, and knows it pretty well. He should be able to help. We’re teachers, so we have several open days this summer. Thanks for posting your photos Dan. The loop you did is similar to the one Tim and I were originally planning. Looks like I need to go back again! Great shots. I’d love to explore Colorado more – let me know when you figure out a date. I may well be able to join if it’s this month or next. As always, incredibly inspirational post – photos and text, both. I’ve been reading your write-ups and trip reports for a month or two now, and since lost count of how many of my velo-friends I’ve directed to WOR and Bunyan Velo. That being said, my question is really mundane: what are you using as a Carradice saddle bag support on the Ogre? On my Troll, there’s a similar support bracket taking shape, but I’d like to try and avoid reinventing the wheel, as it were. Any little tip would be great! Thanks again for the great work, and happy riding. Thanks for your kind words, Adam. The support in question is called a Bagman2 QR with expedition struts. I really like it – but I should add that unfortunately I managed to break the support, which a framebuilding friend repaired. Since then, Carradice sent me a replacement prototype, that uses a burlier tubing. So far, so good. This said, I’m pretty sure the original model is stout enough for most uses. 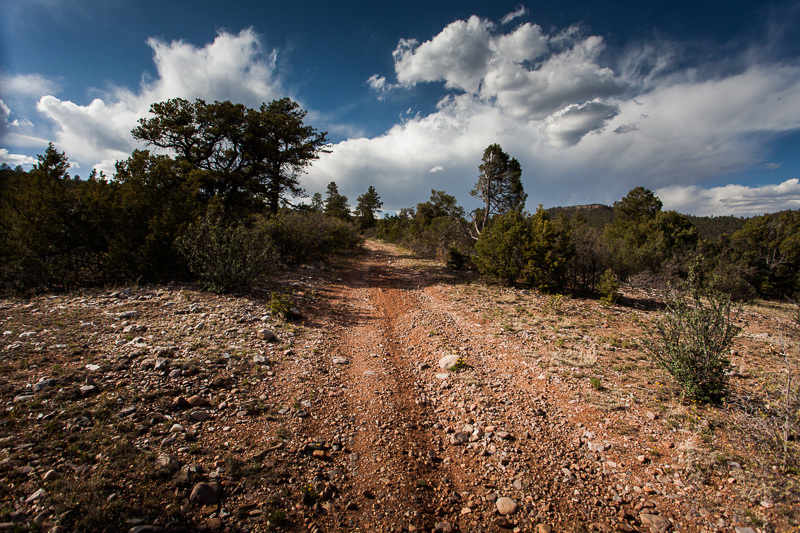 I took it to Sedona, where the terrain is really rocky and challenging, and probably beyond what it was designed for. For dirt roads/gravel/normal trails, I think it’s pretty ideal. 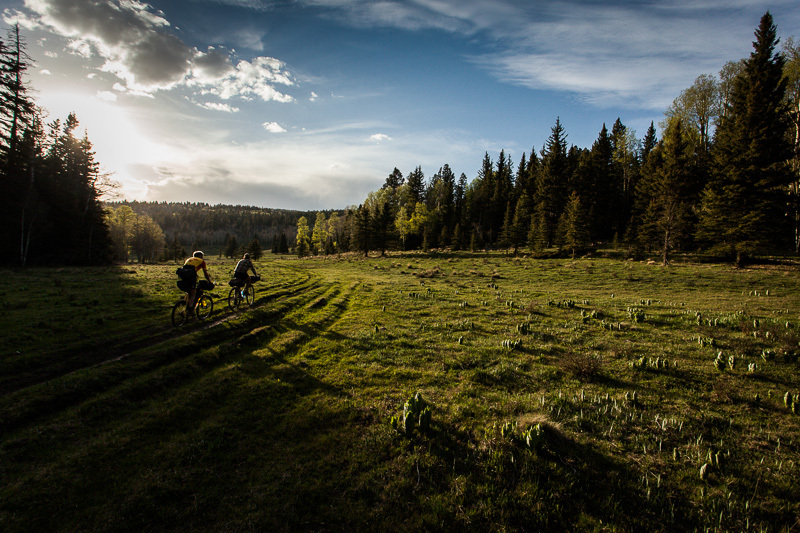 With some friends, we planned to do our first bikepacking trip over june 7-8th in the Jemez mountains. Due to the Thompson ridge fire, we decided to find a different area and your blog provided good inspiration about where to go. Here is a link to our route. We camped up on the spur at the north end by the creek. Starting out and hitting the ridge was awesome. We saw tons of Elk. The route back on day 2 was interesting because we could not find all of the roads that we planned to take, and we bush-whacked it for about 1/2 mile. It made for a lot of fun though. Thanks again for the inspiration! I hope to get up there again soon. Especially further north. BTW, if you stop by the El Rito ranger district office, they have a free map that shows all of the legit roads in the area. 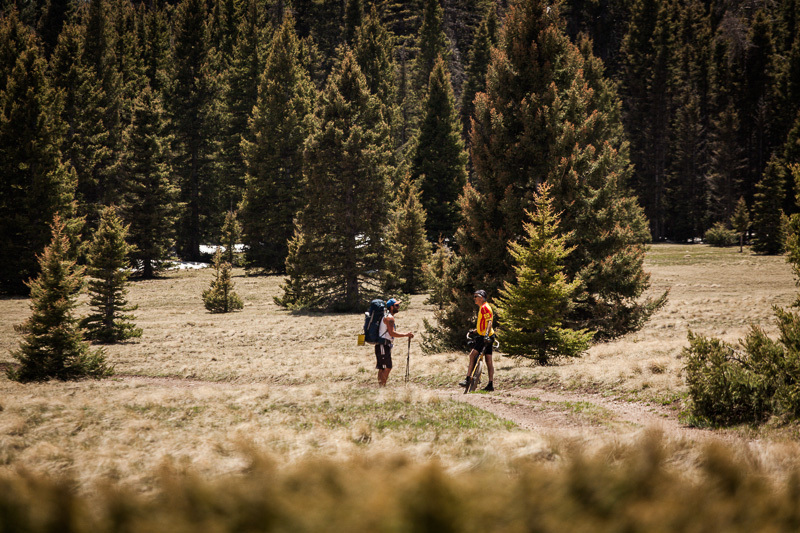 It is still fun to have the 7.5′ topo and try to find some unused roads, but it is always good to know the well maintained roads in case you need to bail! That’s great to hear El Guapo, thanks for your message! Thanks too for the route link, and heads up re the range office – good to know. 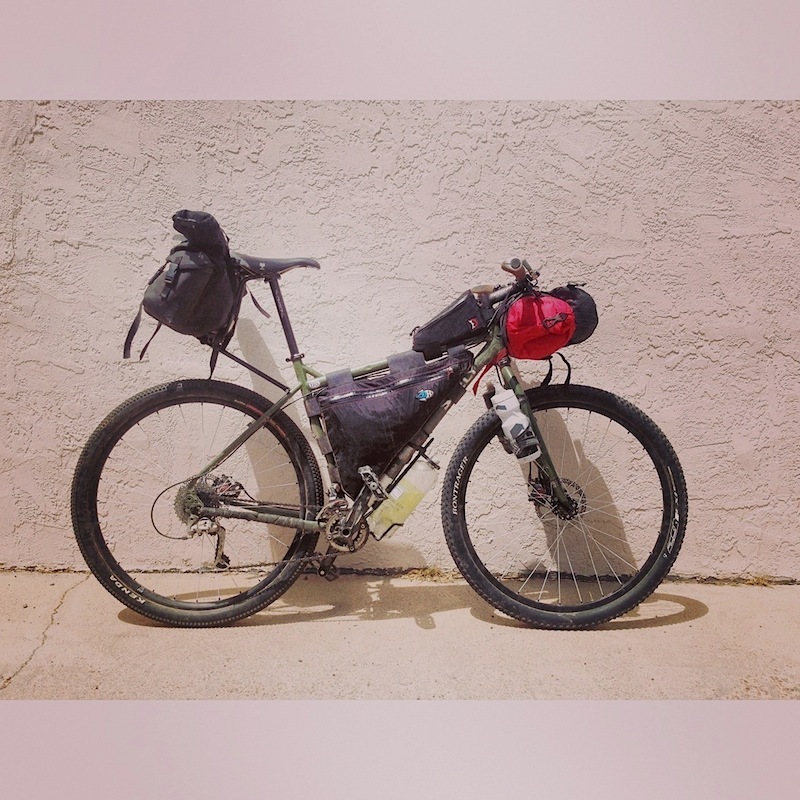 I was just going through some of your older posts and was just wondering how you find the single compartment frame bag as opposed to the duel as I’m thinking of ordering one from Porcelain Rocket soon for my Troll…? By the way this is my favourite blog…keep it up! Right now, I favour the single compartment, because I keep my Macbook Air in my framebag (fits perfectly in a 22in frame). Otherwise, I’d go with a double compartment in terms of ease of organisation. The double, however, weighs more, costs more, and you lose a little internal space. Really though, I think it just depends on what you plan to pack in there. And perhaps the size of the frame – compartments making more sense for larger frames, as they help to hold the shape of the bag, and there’s more room for stuff to float around. Whatever you decide, keep the zips dust free and clean. That’s the only weak point on a framebag. Otherwise, I love them.